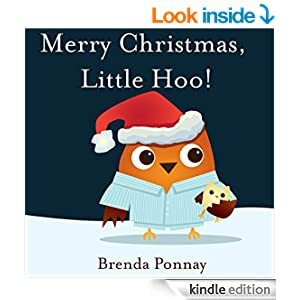 Ebook Review: Merry Christmas, Little Hoo! Home » Ebook Review: Merry Christmas, Little Hoo! Many of you may already know of my love for all things owls. I even wrote a post about it. So you can imagine I would jump at the idea of reviewing Merry Christmas, Little Hoo! By Brenda Ponnay. The story was sent to me in eBook format but I wish it was an actual boo! That way, I could have added it to my owl “collection”. The story is very cute and easy for my son to follow. The whole time I was reading it, I was reminded how similar my son is to Little Hoo. The story is about Little Hoo being oh so excited about Christmas that every little sound he would hear made him want to get out of bed to go see what it could be. Was it a reindeer or maybe some elves? Better yet, could it be Santa? But each time he would wonder what the sound was, his mom and dad would assure him it was nothing to do with Santa or a reindeer. My son is a bit like that but not because he wonders if Santa is coming, he just wants any excuse he can get to stay up and not go to bed. So when I was reading this story I had to giggle on the cuteness of it. The illustrations are nice and colorful! Definitively a fun book to read. Even more so with Christmas just a few days away! I’m sure your little one will really enjoy this story. You can get a copy of Merry Christmas, Little Hoo! on Amazon! Do you enjoy reading to your kids? I love hearing from you guys. Both of my kids read to ME now and I love it. This sounds like a cute book 🙂 I am sure my little guy would love it. I’d love reading this to my niece. What a sweet little story! Oh my goodness, this sounds adorable! I love seasonal books I can read to my girls each year. We get excited to get them out each year. That looks cute! Owls of all kinds are totally “in” right now! Kristen from The Road to Domestication recently posted…Managing the Housework in 4 Steps! This sounds like such a cute book. I would definitely have read it to my kids when they were little. We love to read and my girls love being read to. This looks adorable! What a cute-looking book! I love owls! Lois Alter Mark recently posted…ring in the new year with at&t stocking stuffers — plus a giveaway! Veronica recently posted…Wishing You A Blessed Christmas! Kiddo is reading all on her own these days and I am thrilled by that. While I never minded reading to her, I remember how much fun I had reading on my own and all the places I could visit. So, I am glad she can read on her own now and visit places too. When my kids were little we used to read a book every night at bed time. This looks like such a cute book. I love Little Hoo, he looks so cute; what an adorable mascot to get the kids attention! I enjoy reading to my kids and they enjoy being read to. We went to the library today and got about 12 books, but have already read most of them. I used to love reading to my boys, they are all grown now. But we have our little grandchildren that love to read to us or we read to them. This book looks so adorable. Thanks for sharing. That does look adorable and something that would be fun to gift to a little one. Fun to read to! Oh we love this book! It’s so sweet and the pictures are really cute. This looks like such a cute book for kids. I love all the vivid illustrations. What a sweet character. I think my son would really like this one! I love reading to my kids. I know I need to read to them more. I really need to read to them every night, and sometimes it’s only a couple of days a week. I think they’d enjoy this book.